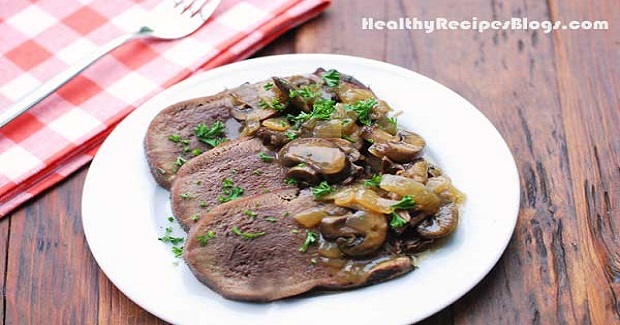 Beef Tongue Recipe - Gutom Na! Posted on Thursday, December 29th, 2016 at 3:45 pm. Rinse the tongue and place in a large stockpot. Add enough water to cover. Bring to a boil. Skim off the foam from the top. Lower heat to a simmer, add the bay leaves, peppercorns and allspice, and cook, partially covered, 3-4 hours, depending on size, turning the tongue every hour to ensure even cooking on all sides. Remove the cooked beef tongue to a cutting board. Allow to cool until easier to handle, then remove the skin, slice and serve, with or without sauce. To make the sauce, heat a large, deep skillet over medium heat. Add the butter and swirl to coat. Add the onions and cook, stirring occasionally, until caramelized, 10 minutes. Add the mushrooms and cook, stirring, until soft. Add broth, salt and pepper. Bring to a boil over high heat. Add the sliced tongue, cover it with the sauce, lower heat to a simmer, and cook, uncovered, for about 30 minutes. If you wish to thicken the sauce, 5 minutes before it’s done, stir in 1 teaspoon cornstarch mixed with a little cold water.